Does The New Year Change Anything? 12/31/2010 - The year 2010 ended appropriately enough. The final day of trading was typical of the previous 364 days. The Plunge Protection Team and every manipulator on the planet was hard at work until the last minute of the last hour of the last day of the last month of the year. The first chart below shows the DIA in 10-minute bars for the last week of the year. Yes, December 31 was a Friday and it was New Year’s Eve. You would think that trading would be light and it was. The DIA traded 3.7 million shares. Over 600,000 of those shares traded in the last ten minutes in a ferocious buying flurry. Now, who would be standing at their station trading stocks a 3:50 PM on New Year’s Eve on Friday afternoon? Somebody obviously thought enough of the DIA to supply 17% of the day’s total volume in the last ten minutes in an effort to boost the stock indexes higher. I wonder who would do such a thing? So, stock indexes had a positive year and ended on a positive note with a positive PPT pushing them positively. Does the New Year change anything? Nope. There’s just going to be more ‘positive’ from the PPT. Don’t attempt to adjust your portfolio. The Fed wants a market bubble and a market bubble they are going to get. Look at Chart 1. Since the New Year is upon us, I’m going to keep this short. As strange as it may be, 2010 ended with the US dollar up for the year and the Chinese Shanghai Composite down for the year. Yes, the world’s most indebted nation enjoyed a rising currency while the world’s fastest growing economy (for those that really count) did not enjoy a falling stock index. See Chart 2. It would seem that manipulation will beat out growth. There in lies our strategy for the New Year. It might be a generational thing but for sixty’s generation, none of us will ever forget Carlos Santana at Woodstock in 1969. His band performed a song titled, ‘Soul Sacrifice’ in front of a half million people or so. Being the sixties, and being an outdoor festival, Carlos ingested some hallucinogens several hours before he was supposed to take the stage (at least this is the version I have read). At least, he thought he had some time for a trip. However, there was a schedule mixup and he was immediately ushered onstage. With his perception chemically altered, the neck of his guitar appeared to transform into a series of waves. Fearful of losing contact completely, he grabbed the guitar neck with his left hand and never let go. The result was one of the greatest performances in recorded musical history. If I have any of this wrong, my apologies to one of the greatest guitar players to ever play the instrument. No, this isn’t a music review. 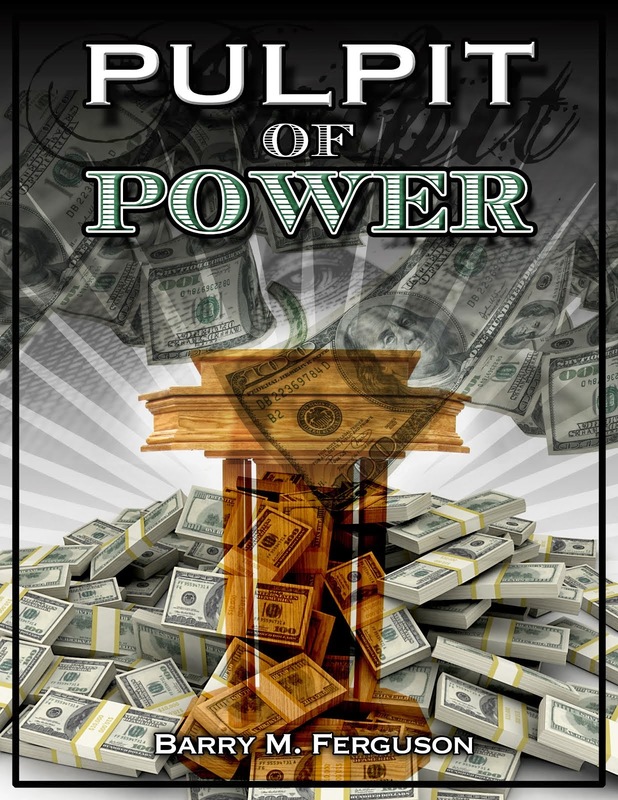 The song, Soul Sacrifice, could very well be the theme song of central bank subterfuge. Santana’s ‘altered state’ could well be similar to the hallucinogenic state of mind of today’s society. The governing elite promise entitlements and services that they cannot possibly deliver. The citizens genuinely expect living standards they cannot possibly afford. Yet, both sides continue to wander aimlessly down a path that only exists in their hallucination. Society’s drug is debt and the central banks are the dealer. This gives the banks the power to rule. The two cannot coexist in mutual prosperity. Central bank power is acquired and reinforced through the sacrifice of a nation’s soul. A prosperous sovereign nation must control its currency. A central bank must control a sovereign nation’s currency. A prosperous sovereign nation must collect taxes to be spent on society’s collective needs. A central bank must control deposited tax receipts to control its subjects. Andrew Jackson won control of the US currency and its tax receipts. He left office with no national debt and a balanced budget. He set his nation on a path of great prosperity. Barack Obama, as all of his predecessors since 1913, will leave office with his country without control of its currency, without any of its tax receipt deposits (they are deposited in Federal Reserve banks), and without any hope of ever climbing out of trillions of dollars in debt that he helped grow. He will leave his nation in a state of chronic despair and under control of the Federal Reserve. How did we get here? Who are those men carrying us? Why are we headed to the alter? Soul Sacrifice opened with rhythmic clapping. The congo players joined and upped the tempo. Imagery of a primitive culture pervades the listener’s mind as it seems we are all high on hallucinogens that make us believe we can borrow and spend our way to prosperity. Someone will have to be sacrificed to make this so. The crowd is gathered and writhes closely together in beat with the music in a trancelike ceremonial dance. On their shoulders they carried us. We have been complaining lately about the distribution of the tribe’s assets. We do all the work. We should get more of the rewards. We feel the soft hands underneath our backs and legs and butts as the crowd extend their arms pushing us to the sky. Some of the hands are rifling through our wallet but we are concentrating on the groove. It’s like we are now body surfing toward the alter. This is so cool! Finally, we are there. Carlos’s guitar attack has slowed. The song is more mellow. This must be the point where some poor soul gets sacrificed to the God of Money. Thankfully the crowd has gently laid us down. They are so nice. The drumming is bit quieter and a bit slower. But wait. Here it goes again. Shrieve is picking it up now. His attack is becoming furious and almost maniacal. His solo is nothing short of masterful. A minute passes. The drum solo is like a benediction to the finality of the ceremony. The rest of the band now joins the drummer and the song is racing furiously to the end. It’s a power wave sweeping everything in its path. The trance is controlled by a pulsating, driving organ line. The song is building a crescendo ending. We look around but we don’t see the sacrifice. Suddenly a hooded figure appears next to us. It can’t be the Executioner. He usually doesn’t come to the alter until the sacrifice is prepared. He is pulling his hood back. Look, it’s Ben Bernanke! What is he going to do with that axe? Suddenly the song stops. The sacrifice isn’t even here yet! But we are. The soul of any country is its currency. The currency carries powerful images of respected leaders and landmarks specific to each country. The citizens’ identity is in their currency. It is what makes them unique. It is their pride. it represents all their possessions. Yet, we stand at the alter of soul sacrifice and passively watch as our brothers and sisters are dismembered from their currency by central banks. Countries have been brought to the alter one at a time. Iceland, Greece, and Ireland have taken their turn. Next will be Italy or Portugal or Spain. The US has already been sacrificed. The banker elite now rejoice in their riches while the populous scrambles for existence. The government elite that guard the banker elite now ask their ruler for assurances of riches albeit on a lesser scale. The banker elite now make the rules to aid their protectors. They imposed the ‘Patriot Act’ that was born from a false flag event to subvert the law of the land so they could more easily intimidate and control the populous. They initiated numerous bailouts and stimulus bills that aided only the banker elite. And now the Federal Reserve is dictating economic policy from a position of currency control. And that currency, along with the nation’s soul, has been sacrificed for the good of the elite banker. The banker elite is doing fine. The rest of us - not so much. What do we do now? Our brothers and sisters are protesting and rioting across the world in protest of the new world order. Americans are for the most part too dumb to even spell ‘protest’ much less realize that the nation of their professed patriotism has sacrificed them in a ceremonial surrender of power. At least the Europeans realize they have been placed on the alter. In the end, they will fall. God only blesses humanity with an Andrew Jackson once. But, investors can’t be encumbered with allegiance to anything other than their own portfolio. Let’s let a few charts guide us in this period of soul sacrifice. 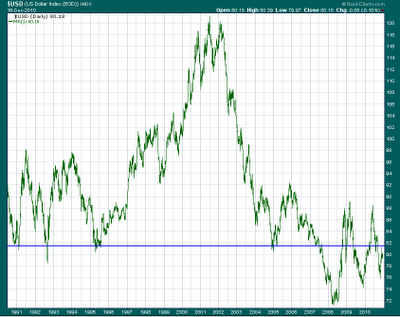 Chart 1 is a 20-year look at the US dollar value as represented by the USD in green. 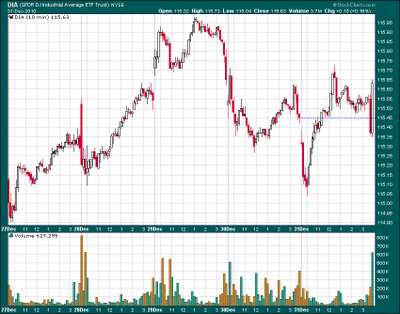 The blue line is a line that I drew at what appears to be the neckline in a big bearish head and shoulders pattern. 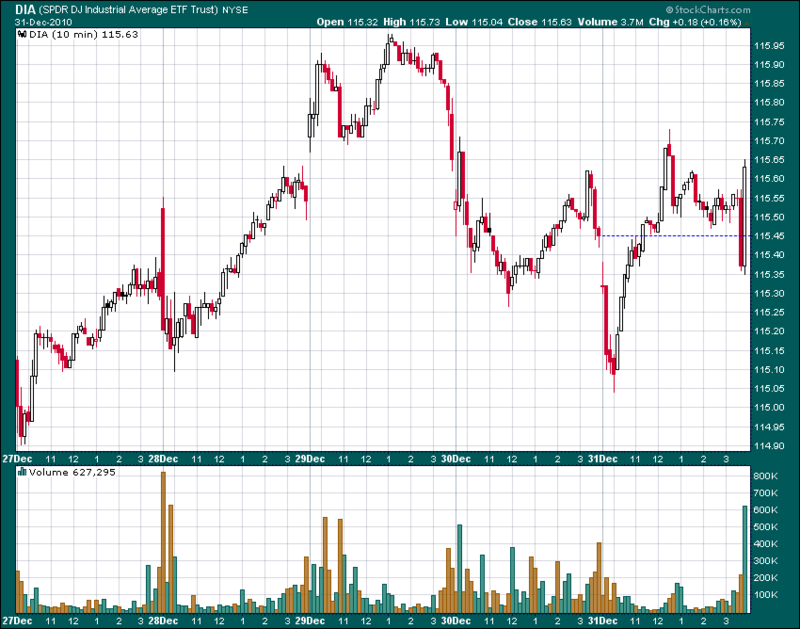 Measuring from the peak of $120 to the neckline of $82 gives us a range of $38. A break in the neckline below $82 would give us a downside target of $44. That’s about a 46% drop in the value of the dollar. Not surprisingly, the USD is fighting the current neckline level very hard. 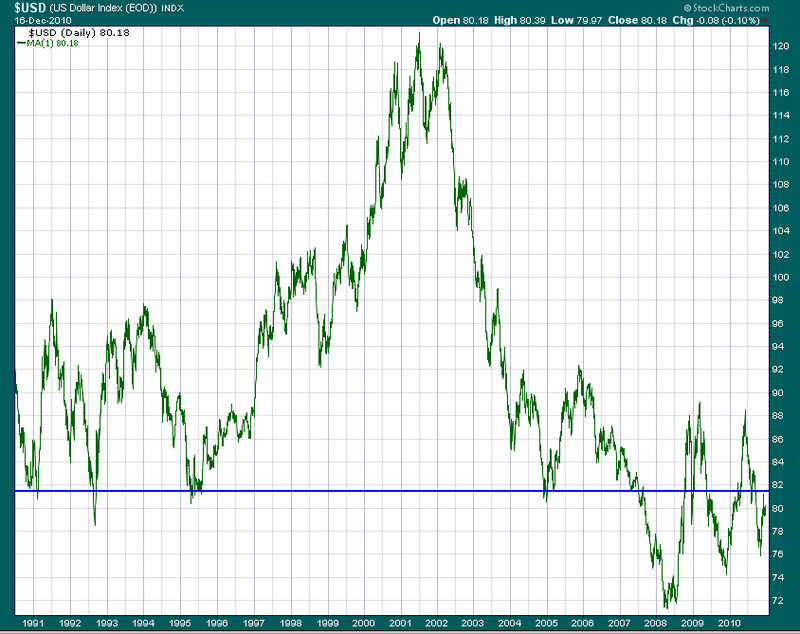 Now, we have to ask ourselves a question about the dollar’s trend from here. Since the Federal Reserve’s inception in 1913, the dollar has lost some 95% of its value (purchasing power). Why would we expect this 97-year long trend to change now? Don’t let this chart slip out of focus. That’s the big picture. What do we do right now? Let’s move to Chart 2. This is the same 20-year time span but I have added the S&P 500 in gold and the Relative Strength Index (RSI) in black. Now we can see how the nation’s soul could be sacrificed so easily. All the executioner needed was the distraction of the stock indexes. Look at the period from 1995 to 2000. Both the dollar and the S&P 500 moved higher in tandem. That makes sense. A strong economy produces a strong stock market and leads to a strong currency. Look at the next three years from 2000 to 2003. A weak economy produces a weak stock market and leads to a weak currency. 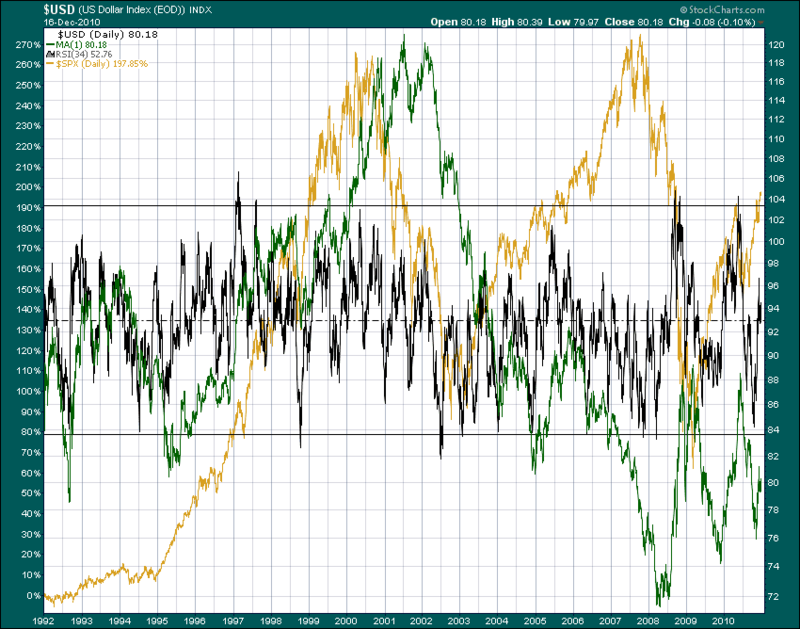 Again, currency and markets were in tandem and RSI was for the most part, fairly calm. 2003 became the ‘disconnect year’ as stocks and currency became inversely correlated. The stock market was headed to zero and even the dumbest American would soon know that something had gone badly wrong. Well, they might not have a clue until their cable TV was disconnected. Then Fed Chairman, ‘Maestro’ Alan Greenspan, took it upon himself to exert final Fed dominance by intervening in markets with currency and credit. The nation willfully complied as it was anxious to recoup stock losses at any cost. The resolution was a change in dynamics with the Federal Reserve suppling copious credit, debt exchange, and currency. The nation’s soul had to be sacrificed. And so it was from the sharp edge of the printing press. The currency continued lower but in an effort to avert a populous uprising, the bankers manipulated the stock indices higher. This is the ultimate pacifier. But since 2003, when the dollar rises, stocks fall. When the dollar falls, stocks rise. The sacrifice continues. So what do we know? Weakening currencies benefit the central banker that controls such currency. Weakening currencies boost stock markets. Does anybody think that the Federal Reserve or Congress will work going forward to strengthen the currency? Hey, it’s Christmas - I thought we needed a good laugh! When you stop laughing, please continue. Let’s see if we can make a prediction on currency and therefore stock trend for the coming weeks. Look at Chart 3. This is the past three months of the USD. As we zoom in, we can see what I believe to be a couple of mast with pennant formations. I have drawn the first one with a blue line and the second with a green line. Generally, these formations come in threes. Therefore, I think we are breaking out of the second pennant and forming the third mast (dashed black line). 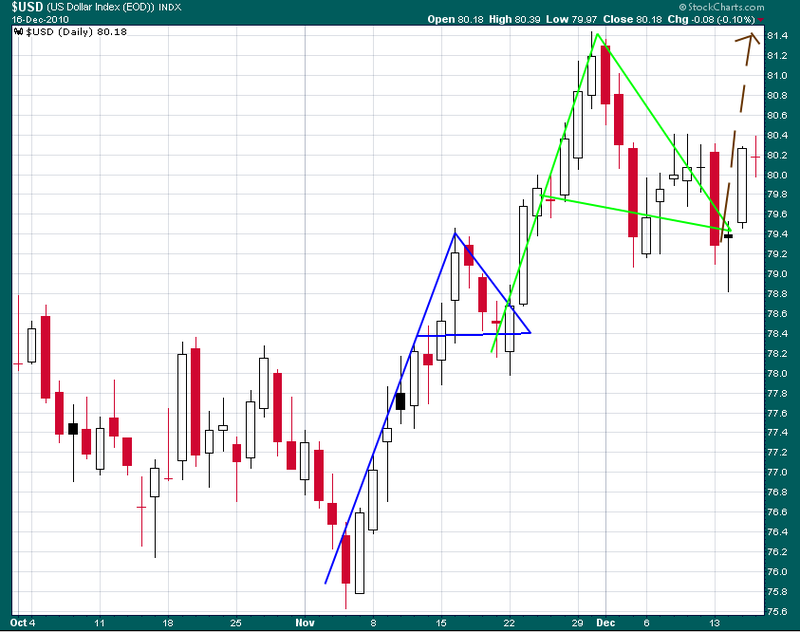 This may take us up close to the bearish neckline in Chart 1, form a final pennant, and then fail to the downside. If so, we may have a few more weeks to rally the dollar during which time the stock indices might stall. If at that point the dollar breaks lower, we could expect to see the dollar fall much lower thus instigating another strong inflation-fueled stock rally. We should know by the first or second week in January. A wise investor may want to go light on stocks for the next few weeks in anticipation of a rally opportunity in early January. What in heaven’s name will make the putrid US dollar appreciate? The dollar’s value is heavily inversely correlated against the Euro. The central bank of Europe, the ECB, is fighting frantically to save the banks of Europe from the debt implosion of its member nations. The worry over the expansion of the bailout package offered in May of this year is weighing on the value of the Euro. The US dollar is strengthening as a result. As the debt contagion continues, the Euro falls and the dollar rises. This is no hallucination. The soul of Europe is getting sacrificed to keep the bankers flush with cash. Ditto for the US. The central banks need the government to carry out the trivial task of governing the trifling citizens. The governments need the central banks for monetary survival. Standing between the two is the alter of soul sacrifice. Nations may willingly visit the alter. Investors will have to fight to survive! The US and China seem to be at opposite polarity. The US rulers are trying to inflate the economy and thereby reflate the stock indices. 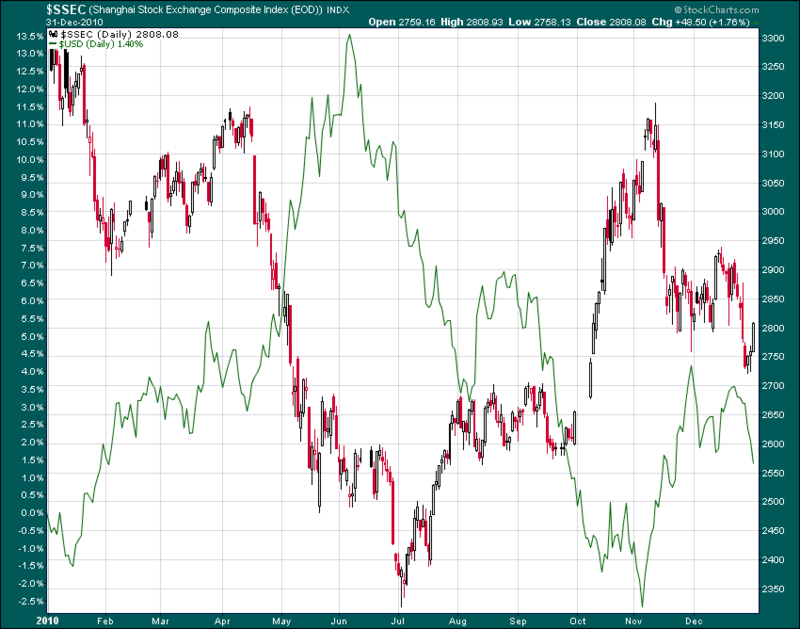 China is trying to deflate the economy and thereby restrain their stock index. To Ben Bernanke’s credit, he has been specific about his desire to see inflation rise in the US. To his discredit, real inflation is already locked in with a rear naked choke hold that is turning the consumers face blue already. The Fed and the US government have of course always lied about real inflation and they have changed formulas to match their desired story. China, on the other hand, is now openly trying to contain inflation that they measure at an annualized rate of over 5% as they announced this week. One wonders why the Chinese don’t just lie about inflation like the US does. In truth, the Chinese recognize that an over-heated economy eventually crashes and that is the scenario they are trying to avoid. The US, on the other hand, has already pushed the plunger of economic destruction and only has one option left - the Zimbabwe option. They are going to try to inflate their way back to prosperity. 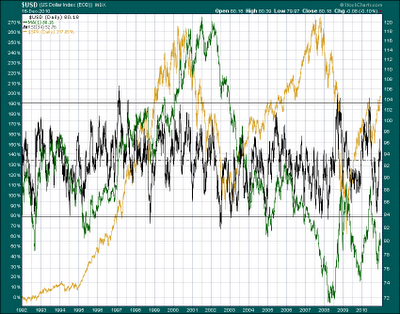 The interesting thing is the effect inflation has on the stock indices. 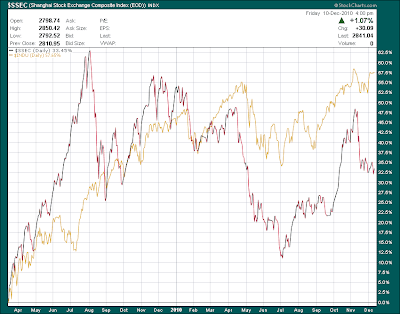 The chart below clearly shows this effect by comparing the Dow Jones Industrial Index in gold to the Shanghai Composite in Red since the ‘magical’ Fed induced lows of March, 2009. As we look back, that was the point at which the Fed threw trillions into the markets via the banking system while the Treasury spat out trillions in new debt to do everything from lending support to the Fed to buying failed US corporations. We mustn’t be hard headed - trillions of dollars injected into the system does have a positive effect. 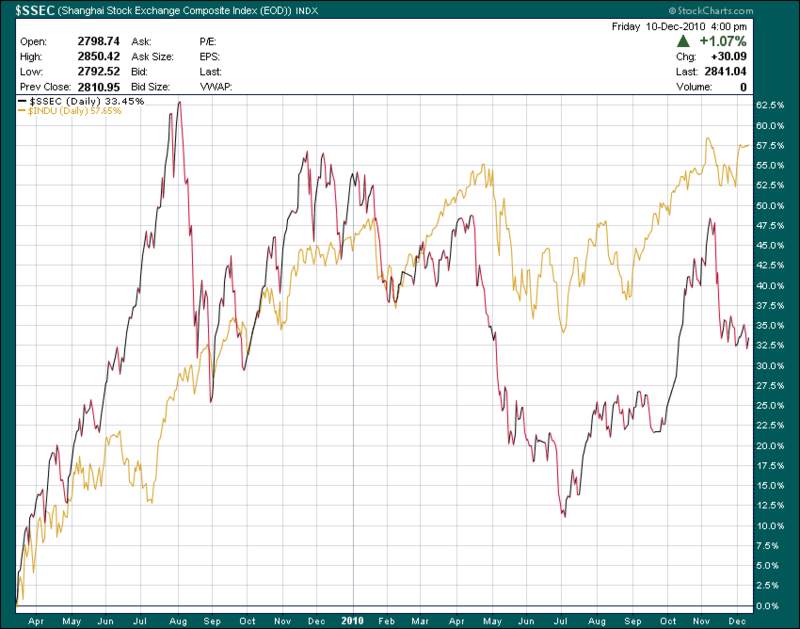 The chart shows us that the Dow has outperformed the Shanghai Composite pretty handily since the March ’09 lows. During this same span, the Chinese economy has expanded at three or four times (at least) the rate of the US economy. Yet, the stock indices would imply the opposite. Can we simply infer that that stock indices are more of a function of inflation more so than anything else? It would seem so. Back to Zimbabwe, it would be hard to find an index that performed better than the Zimbabwe Industrials in 2008. But again, their economy was completely disintegrating but the printing presses kept inflation racing higher by the hour. That brings up an interesting question. Where would the Dow be trading if not for the extraordinary manipulation and intervention of the ruling Fed? Consider this. The Dow is about where it was ten years ago when the nation’s debt was less than $6 trillion. The US has essentially committed to another $8 trillion to keep the Dow from falling. Without that $8 trillion, might the Dow be at 1,000? We can certainly presume that the 4,000 point rally from the March ’09 lows were due to massive commitment of debt to the cause. If that rally had gone in the other direction, the Dow would be at least below the 3,000 mark right now. Further, the capitalization of the US markets is somewhere in the $13 trillion range right now - give or take a trillion. Take away that extra $8 trillion in debt and the charts would show a different story. Debt is of course money that neither lenders nor consumers really have. Since the US is not a saver nation, we must assume that the consumer spends everything they have and everything that anyone lends to them. We can also factor in to our scenario that the fractional banking system turns a trillion into ten trillion. So again, where would the indices be if not for an extra $8 trillion in debt to inflate the credit system to inflate the stock indices? 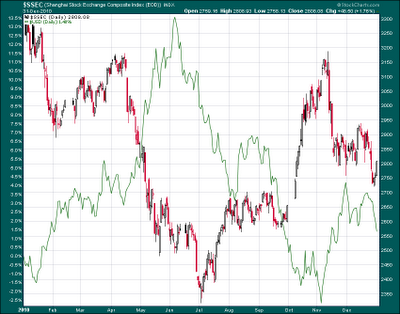 Look at the chart of the Dow and the China Composite. If we want the Dow to continue higher, we must hope that Ruler Bernanke keeps flooding the system with credit supported by increased US debt. Sure, the resulting inflation would destroy the economy in its path and the poor suckers that eke out a living from such economy. But screw them! All that matters is a rising Dow Jones Industrial Average. Besides, while the suckers are drowning in a rising sea of inflation, they will be tricked by the rising Dow into thinking they are just taking a swim. By the time they lose sight of land, it will be too late. It would seem apparent that the Dow could make new highs within a year or so. All we need is for the national debt to rise by a few more trillion. Now, if the national debt could just rise to $50 trillion or $100 trillion... Aww - I’m dreaming now! Do we really want congress to cut the deficit? Maybe we should check the chart one more time!